I’ve been using a Mac Pro for many years but it’s time to upgrade my computer. I’m not ready for the investment that comes with a new Mac Pro so I’ve settled on a 27-inch iMac. The problem is that I want to use the four hard drives that are in my current Mac (set up as four separate volumes) with the new iMac. What do you suggest? Today’s iMacs have both USB 3.0 and Thunderbolt ports, and enclosures are built with each kind of connection in mind. As far as you’re concerned the difference comes down to price and—depending on how you configure the drives—speed. 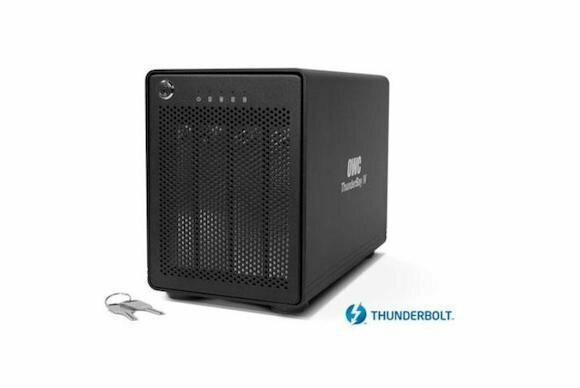 For example, at Other World Computing you could purchase an empty ThunderBay IV 4-bay Thunderbolt enclosure for $439. For just $269 you could have the company’s 4-bay Elite Pro Qx2 enclosure, which supports eSATA, FireWire 800, and USB 3.0. That said, Jim did tell me that if you configure those four drives in a striped RAID array, USB 3.0 could prove to be a bottleneck. In that case you’ll want to go with Thunderbolt instead.